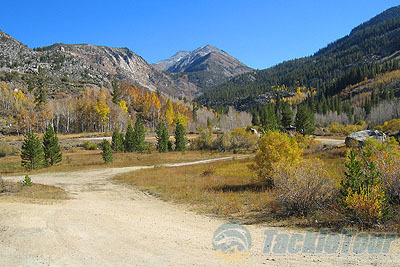 Introduction: With the weather cooling it is time to mix in some trout fishing into our normal bassing routine. 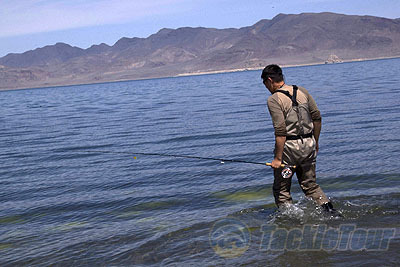 When fly fishermen think premium wading apparel Simms is often high up on the list. The company has long been known by fly fishermen for both build quality and performance and is a top choice for working guides that are hard on their gear year round. Simms has been introducing more boots featuring StreamTread Vibram based soles which are designed to offer the grip required to remain upright in streams and lakes but are easier to clean as well as help prevent the transmission of aquatic fish killing diseases. Impressions: First let�s examine the reasoning behind moving to a non-felt pair of boots. 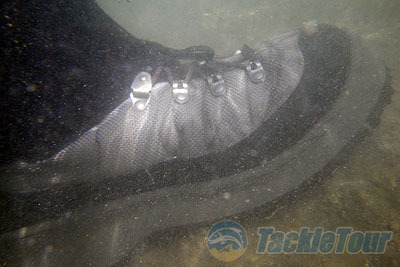 I think most of us have grown to appreciate the benefits and reliability of felt soled boots, but what we can�t see is that these boots remain wet long after leaving the water and are often hard to clean. This makes it possible to transfer invasive species such as mud snails and didymo which have become a growing threat to the health of trout populations and aquatic ecosystems. In an effort to promote eco-conscious design CleanStream� design was introduced. 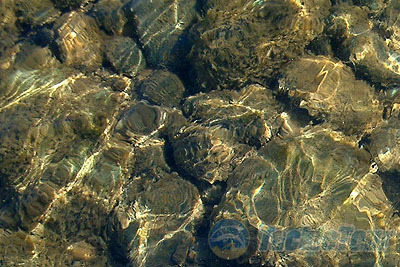 CleanStream� is a design philosophy that highlights a combination of features that the company utilizes to assist anglers in doing their part to prevent the spread of invasive species. Products with this design feature materials that are more resistant to �hitchhiking� organisms and have less exposed stitching and fewer ridges and pockets that could potentially hide stowaways. This design makes the boots easier to clean and maintain as well. While Trout Unlimited is asking boot manufacturers to phase out felt by 2011 Simms is already ahead of the curve with their offerings. 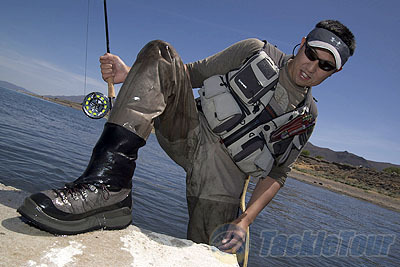 The G4 Guide Boots are the top of the line wading shoe from the company and are designed for serious anglers and guides. The G4 features a wide overall design with a two tone finish that makes use of Schoeller� dynatec high performance abrasion-resistant mesh panels. The stitching is exposed whenever possible for increased durability and to help make the boots easier to clean. 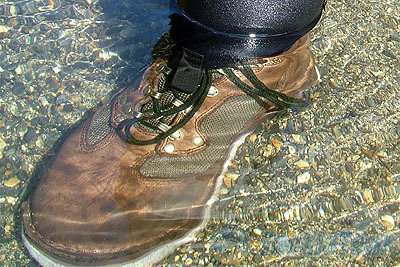 StreamTread sole makes the boots look more like a traditional pair of hiking boots rather than application specific wading boots. The G4 is also fully lined with neoprene for reduced water absorption. The G4 boots are offered in a wide range of whole sizes from 7 to 14EEE, and you will want to go one to two sizes larger than your normal shoe size depending on the type of waders you own and how tight you like your boots to fit. If it feels too loose than you definitely need to go down a size as a loose boat will negatively affect your ability to navigate treacherous water. Overall the boots felt heavier dry than felt based Simms or Hodgeman boots I have owned in the past, and I was eager to see how this would translate once wet. The large leather tongue makes it very quick and easy to get in and out of this particular pair of boots especially with the G4�s speed lacing system. At the base of the speed lacing system Simms cleverly includes a roller guide which allows for friction free adjustment of the G4 making it effortless to tighten or loosen the boots quickly without having to forcefully tug on laces. 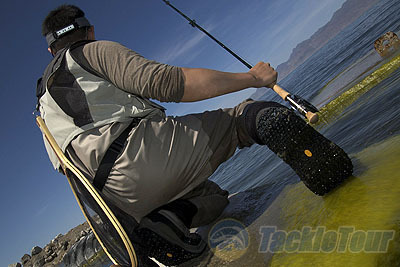 There are many elements of tackle that you can purchase online but this is one where a trial in store with the same type of waders you plan on pairing the boots with is a good idea, this will ensure you purchase the right size and have a truly comfortable and functional fit between your waders and the boots. With our initial inspections done and feeling rather odd all suited up in the lab we decided it was time to break down the gear and load the truck and go fly fishing. 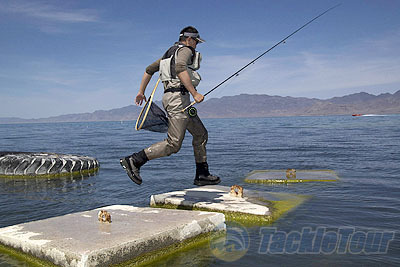 Real World Tests: To test the G4 Guide Boots we head to a number of Northern California Rivers to fish for trout and steelhead, as well as travelled east to the Truckee River and Bishop then concluded our tests on a trip to Pyramid Lake in Nevada. 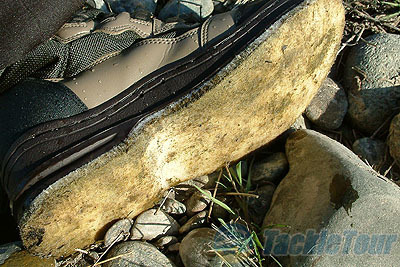 Unlike normal outings where we avoided slicked over structures or sharp rocks we deliberately searched out these obstructions to see how the StreamTread sole would compare to a pair of previous generation Simms Guide series boots as well as Hodgeman Wadetech boots, both of which had felt soles. Performance: A lot of the rivers up North including the Feather and the Yuba have quite a bit of moss growth at this time of year and Pyramid Lake also had an unexpected level of algae growth as well. We tested the G4 on a number of slick surfaces side by side against felt but even before we started these comparisons I noticed a number of interesting performance attributes with the G4. In the lab I remarked that the boots were rather wide and when looking down at them they looked somewhat like moon boots with the markedly wide toe section. While it took a little getting used to cosmetically the benefits in comfort while hiking on the shoreline or walking in the water were clear. There was no bunching of socks or waders inside the G4 boots and my toes never felt cramped at all. The second thing I noticed before I really got fishing was that while the boots do indeed feel heavier on land than some other boots I�ve used in the past but once they are in the water they feel pretty comparable. The wet weight is relatively similar, and because the StreamTread soles to not absorb water like felt they make up a little weight there. The G4 boots also feel much more like a normal hiking shoe over long distances than felt soled boots and felt right at home when walking on sand or gravel. Once I had a chance to really walk around and traverse faster moving water I further appreciated the molded toe and heel counters and the G4 delivers exceptional ankle stability when moving over rocks at odd angles. This especially came into play on the Truckee River when I deliberately moved across faster moving water lined with rocky outcroppings. With normal rocks the StreamTread soles perform just fine and I felt confident moving at the same speeds I would normally walk in felt, but rocks that were covered in vegetation were a slightly different story.